PhoneGap Image Generator makes it easy to generate the app icons and splash screens needed for PhoneGap/Cordova projects. It’s optimized for use with PhoneGap Build and Visual Studio. 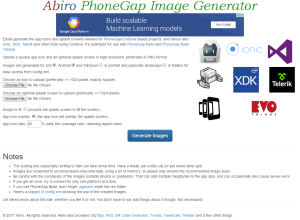 PhoneGap Image generator was developed by Abiro during 2015, but has been improved over time.